Note: The 40 - 60 export crops to be developed are not appropriate to be discussed on websites as export agriculture is a competitive international commerce. Any discussions will place Vietnamese farmers in a disadvantage against existing larger exporters especially from China. Chinese agricultural crops are well known for using illegal biological additives, generic agents to growth enhancements on any crops and thereby they can effectively resort to any predatory practices over other countries. We do not support any use of bio and chemical additives and actively promote the use use non-chemical or natural treatments to respect people's health and to protect our environment. We will discuss program highlights for informational reference only. (c) Cohesive, effective engine or organization to implement them. Successful planning in agriculture is much more difficult than building a high rise because we have to account for unpredictable and uncontrollable elements. Our first 5-year plan is designed to established foundations, structures. We expect to achieve a relative self-supporting level for farmers in 3 years; Agricultural Plans will be systemized with support strategies and mechanisms to assist farmers and their families to self-subsist during the interim periods where they may be financially struggling. There are agriculture-related strategies and non-agriculture strategies, which will be discussed throughout this Chapter. To meet our economic objectives and to minimize costs while maximizing efficiency, we must organize agricultural sites in tight and unique cooperative systems unlike typical farm groups in other countries. This is due to our limitations in many different fronts from finance, machinery, infrastructure, skill education, processing facility and logistics. However, VINAREX has sufficient experiences with tropical agriculture in other countries from Central America, China to Hawaii to know how to develop these systems to meet our objectives with limited resources especially with the diligence, endurance and dedications of Vietnamese farmers. However, all of these dedications and effort are meaningless until government policies and practices are supportive of our hard work. ORGANIZATION and PLANNING: 18 - 24 months of detail planning, comprehensive preparation, seed developments, pre-production market establishing etc. Written programs and contents have been completed. This phase is to form the organization in 2 or 3 stages; This organization is responsible for writing the plans, set up all mechanisms and bodies and perform site planning, training, recruitments, contacts and relationships with various private and public agencies in Vietnam as well as seeking internationally for support, funding, organizing, training activities, etc. This 1.5 years will also allow the science and R&D dept to acquire, develop and create sufficient seedling program and related planning functions. This is a typical phase for any organization. VINAREX can be more complex as it must incorporate international, intergovernmental and internal core departments. 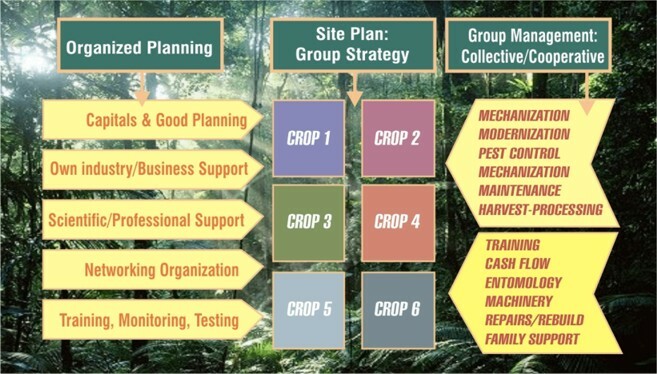 Site Planning may involved groups of crops at selected regions suitable for such crop and support bodies. While research, planning and prep tasks being done, seed programs are planned, implemented and prepared for future planting. During and upon the completion of Phase 1 above, about 40 different crops and support industries will be established. Production maturity or readiness will vary with each crop or business. Selection of crops will base on existing consumption in world's markets. We will not focus solely on the consumers sectors but include the industrial, processing and manufacturing sectors based on our knowledge, experience and evaluation of the facts. Focus will be export and industry-oriented crops; Industry focus is on the food processing, cosmetic, pharmaceutical and specialty markets. We will not focus on conventional, existing domestic use crops. Root groups are important to support the export process but we must carry out in highly advance forms to better compete with China. These long term crop groups will be developed over 4 to 7 year span due to their long maturity. Their markets are not limited to decorative use but for our long term industries from pharmaceuticals to wood. 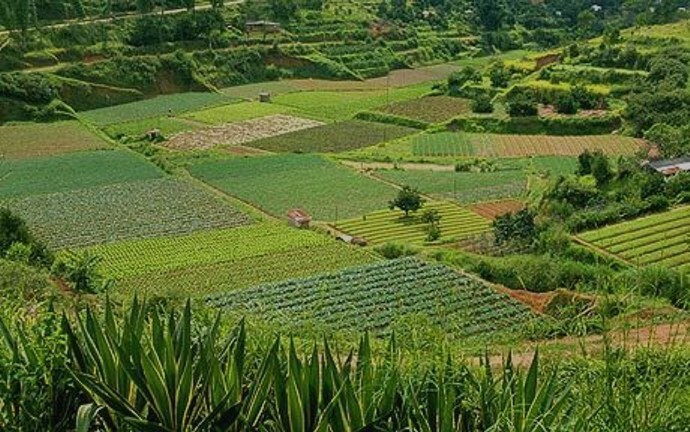 Our agricultural plan is a nation-wide plan on a larger scale with each crop is designed to become AN INDUSTRIAL STRENGTH crop for Vietnam therefore they are planned quite differently than a typical crop being developed by an individual company. To support larger exports we must develop and organize a system and a network for each crop group thereby infrastructural foundations and processing facility can be made possible at lowest cost. Certain crops require long term planning due to reasons such as (a) additional construction of processing center (b) plant or seedling maturity (c) suitable site planning and government cooperation, etc. However another 60+ crops will be our target for the next 10 years. The last Phase of the agricultural program is the completion of approximately 60 long term crops and their support systems, infrastructure and marketing foundations. Long term crops are developed later but will be significant for long term growth the the specific industries we have in mind that we will develop for these crops. These crops will also contribute many factors in regenerating the environment, forestry resources and global warming. Long term crops are with more stable export markets and therefore need more organized planning in processing facilities. They generate larger number of long term businesses and facilitate broader industries compared to short term crops which are primarily for food, consumption. Industries related to these crops are develop during this period: Wood, Pharmacology, gifts, furniture, etc. Various long term industries we have planned for these specific crops such as WOODS, FURNITURE, PHARMACEUTICALS, TOURIST GIFTS, DRIED GIFTS, etc. These are suitable for the dexterity skills by most Vietnamese men and women. As professionals in agriculture, import and export, we understand the needs of other countries to protect and prevent the migrations of undesirable insects, diseases and even viruses associating with agricultural exports. Unlike in China, we advocate the elimination and prohibition of the use of bio-chemicals, hormone stimulants and untested pesticides. Agricultural exports mean strong long term planning and strong enforcement of plant quarantine regulations and criminalization of export violations to protect the interest of our export and to respect other nations of their economy and public health. We will advocate the use of scientific and technological instruments and method for insect control and eradication and will devise strict and controlled atmosphere planting condition to promote an insect-free, bacteria-free export from Vietnam. An effective insect and disease control plan is essential to both export and domestic agriculture. Without one, we cannot export and we are confident in our ability to set up a program as such in Vietnam due to the large labor force we can employ to do the work. Specific control plan w/ specific target insects or diseases on specific crop must be in place within the site as well as the entire locality surrounding the agricultural site. This is important and beneficial for all when insects are always monitored and eradicated anyway. Nationwide plans seems large but costs less in long runs as they prevent the spread of insects and alarm us of new insects. Nationwide plans are excellent to agriculture as well as for the environment, for public health and for other industries. We will develop also a vector (mosquito) control plan for Vietnam especially in disease-frequent regions due to mosquito. Our emphasis and priority will be the use of NON-CHEMICAL methods as discussed thru-out our website. Although the use of chemical insecticide is still a must, we must train people more about the proper applications and education for a safe and smart use of chemicals. We are against the reckless use of bio-chemicals and systemic pharmaceuticals by the Chinese. These will be dangerous for humans, especially for children and pregnant women. They also incubate and transmutate new pathogens beyond our ability to control or detect. Unlike domestic crops or small scale exports, nation-wide agricultural plans require a systematic and effective insect and disease control plan for (a) The specific crop (b) The entire geographic areas where such crop is located (c) The monitoring network covering at least 50 miles radius to the crop site and (e) A system of long term insect and disease research and development plan with focus on CRITICAL INSECTS OR DISEASES that can be detrimental to Vietnam's agriculture. We will focus our entomology and pathology programs more on the use of NON-CHEMICAL control, NATURAL AND BIOLOGICAL control with extensive use of modern technology or equipment that least harmful to the environment, to useful species of plants of insects. We are against the reckless use of bio agents, antibiotics and hormone stimulants like the Chinese and will actively educate farmers about the dangers to humans, children and the environment associated with these use. Other SUPPORT BUSINESSES, SUPPORT INDUSTRIES, INFRASTRUCTURE AND ENVIRONMENTAL products and projects are developed at the same time with our agricultural plans. As mentioned earlier in other parts of this site, agricultural crops are not the focus of our Organization. We will develop other support industries to support long term agricultural crops, to finance other infrastructural plans, etc. We will also create and construct a nationwide Bacteria-free greenhouse and indoor industrial-level productions thru-out Vietnam. Discussions for these programs are made in their respective chapter. Other concurrent development plans in INDUSTRIAL MANUFACTURING, INFRASTRUCTURE AND ENVIRONMENT are discussed in the respective Chapters. "Multi-level support dynamics" must be incorporated and comprehensively planned in all sensitive businesses or projects during the development stage. This simply means that at each level or layer of operation, we must design added support actions and contingencies to sustain that level of operation for this is NOT a charity operation but an industrial process. But unlike Westerners' impersonal styles which is not productive with Asians, we will be genuinely caring, personal to suit Vietnamese. There is added cost to design support systems but for Vietnam with a ready and willing labor pool (vs. US with harder to please workers) and with our concerted effort with government bodies, this multi-support system is much easier to plan. MULTI-LEVEL SUPPORT SYSTEM for each crop or crop group means that External and Internal support activities are planned to support all aspects of work and personal life for the crops and for the farmers and their families. With an organization with multiple, multi-front agricultural or economic plans, this support system is possible and will induce better production, better results at lower cost that any conventional farms or private company to do. This system is cohesive, cooperative, comprehensive but cost-effective when we know how to plan. Other industries and businesses are created to generate income to support agricultural plans during the development stage: Cash flow, production quality, short-term financing etc. These businesses and/or industries can become independent industries on their own and supported by agriculture in return after 5 years. These typical support services are for example (a) Training at various level (b) R&D dept to provide support, technical services; (c) Insect/fertilizer and mechanical/equipment services (d) Continuing education at local universities and support consulting services by students, etc. This INTERNAL support system will be designed for each crop group at each agricultural site developed by us. It means that: We will develop crop by-products, marketing diversity and strategies to bring added income to support the crop from cash-flow, supply purchases, equipment purchases, etc. Family and personal supports are also important for productivity and security. Farmers in our programs will have the priorities for loans, health insurance, equipment and expansion purchases. Family members also have priority to work in our organizations, to purchase other infrastructural products we produce at low cost, etc. By designing a comprehensive support structure for each crop, each agricultural site and every farmer family and members within our programs, we can wisely create production strength, product quality, collective maintenance/processing/harvesting/shipping at lowest cost. It may seems more costly but it is NOT if we know how to plan intelligently and cohesively. Another strategy in our development of export agriculture is to make effective use of DYNAMIC GROUPING. This means that selective crops with similar planting conditions (different market is OK) will be planned collectively at one site during the 1st 2.5 years. Plant sites may cover 1 to 3 nearby Provinces but will use 2-3 packing/service plants and 1 export processing location. When designing and planning intelligently, GROUPING can help us to design, plan and schedule all the preparation, planting, pesticide/fertilization plan, to harvesting-processing-shipping work effectively at minimal cost. GROUPING strategy is necessary and productive for our mechanization, modernization, monitoring, testing, and all other quality control work for or with the farmers. We will also make active plans to work closely with local universities to provide students of various majors to participate in our programs as PAID INTERNS. This will encourage empirical education and community involvement. With grouping, mechanization can be done conveniently at low cost. The entire planting-harvesting-support process can be planned, scheduled and conducted to ensure results for the farmers and for the organization. Collective grouping of sites can help us to meet all our pesticide and insect control objectives and product quality for export. When collective farming and management can be done, it is much easier for us to plan and to require SPECIFIC PRODUCT STANDARDS to meet or exceed export quality from other countries. Grouping Strategy also help us to perform our MULTI LEVEL SUPPORT SYSTEM work a lot better and cheaper. In our business and to deal with international importers, we must learn to be honest, trustworthy and professional. Such integrity can be achieved better when structures and groups are in place. GROUPING strategy simply means that we have to design numerous crops at 1 or several nearby provinces to help us plan and execute critical operational tasks for all crops to clearly meet export standards + export quarantine objectives. We must have government supports to create and realize this strategy. In return, we will contribute to local infrastructure, local education and increase our contribution to the local communities, cities. This is an "ALL-WIN" situation for all parties. This is both a PLANNING STRATEGY and a PRODUCT STRATEGY. It means that each crop is developed with related business options and by-products with high returns (a) to support workers, farmers and family (b) as a means to manage cash-flow, expenses during pre-harvest period; (c) as a means to lower break-even point (d) to maintain group cohesiveness or (e) to pay for future expense and other infrastructure improvements, etc. These are some examples of other creative support projects we must add to each crop in Vietnam. By products, processed or fresh can be effective to support the main product in the future while supporting the staff and/or expenses in between. We also must make plans to turn by-products into permanent long term inventory for us. Export brokerage of similar items prepares us for the market while expanding the product services of the group. These added services needs no added investment but training can be excellent for farmers or his family so the family can be more educated about the products we produce. Pre and Post Maturity plans are typical of development, For example, Green Papaya as pre-maturity and over-ripped ones for processing or packaged food sales, etc. This strategy prepares us for contingencies but also prepare us for future expansion. A set portion of crops can be resold for selective market at set low price or to create partnerships with others for the same crop. These are common marketing tools for agricultural products that we must develop concurrently with the subject crop. A typical life of farmers evolves around his farm and we will take an active part in working with farmers more as family than as a worker. We do not follow the impersonal management, philosophy of Western nations whereby farmers are a commodity and a math. We will create support programs - finance - social - family - for every field operation. Support programs are also intended to bring interim income to lower our break-even points for impending crop. This is not just a good sub-strategies but a better human relation management. This is our working methods and a foundation of our relationship with workers and farmers.